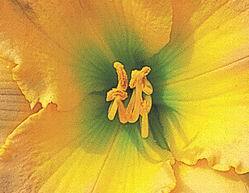 The beauty of the flowers as well as the unlimited possibilities to cross with daylilies does appeal to me. I also take a lot of photographs of the flowers in my garden. In fact you can say that my hobby has turned into a passion. I try to combine the daylilies in my garden with a lot of different annuals, some perennials and several flowers from bulbs, which is very common in the Netherlands you can imagine. A lot of pictures of those flowers you can find on my website. I try to have a garden that blooms from the early snowdrops in February until the last dahlia in November which disappears when the first night-frost arrives. My collection of daylilies particularly consists, besides some older species, of new cultivars from hybridizers of the United States. Especially cultivars by Patrick and Grace Stamile, Frank Smith, Jamie Gossard, Joel Thomas Polston, Dan Trimmer, John Kinnebrew and Ted Petit I truly admire. I also make a lot of crossings with modern cultivars hoping to create awesome new cultivars. 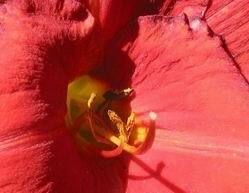 My main purpose is to breed scarlet red dormant daylilies with appliqué patterns and white shark teeth. I will be in heaven when they also turn out to be very fragrant. I intend to sell some of my unique hybrids in the future under the name of FRISIAN UNIQUE. The purpose of this project is to give the buyer the whole plant, so he/she can make a registering of the plant and do business with it. I hope that more and more people will enjoy the charm of the daylily and will discover by this website the possibilities to combine them with annuals and flowers from bulbs. I wish you lots of pleasure with this website.